Chicago comedian and actor Lil Rel Howery is the glue of the film, portraying the coach of a team old guys from the 1960s – actually current and ex-NBA/WNBA stars in old folks makeup – and taking them to the Rucker Classic, an actual playground tournament that is the stuff of legend. The film is loaded with classic African American culture… the barbershop, going-to-church and the playground b-ball court… but it also works as a sports comedy, as the old dudes play at a pro ball level behind their makeup, which makes the on-court action as strange as a fairy tale. Props to those b-ball stars for their acting ability, as off the court they did seem like old men and women. This is the fun, non-dinosaur alternative for July 4th. Lil Rel Howery is Dax, an orphan who grew up with a passion for basketball, who ends up coaching a high octane team headed to the Rucker Classic, the top playground tourney. He runs up his credit debt keeping the team and his girlfriend Jess (Tiffany Haddish) happy, but still ends up without a team and Jess when his rival Mookie (Nick Kroll) steals both away weeks before the tourney. 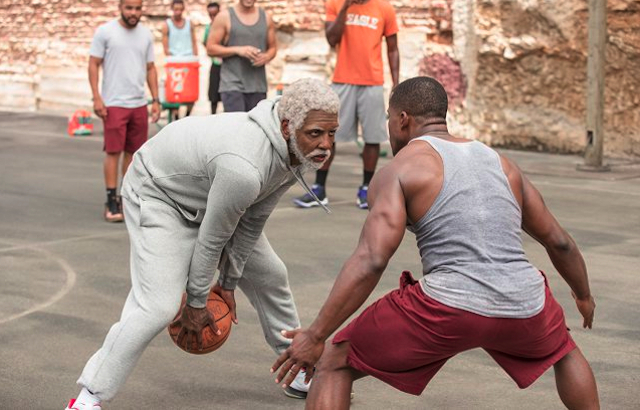 Enter Uncle Drew (NBA star Kyrie Irving behind old age makeup), a Rucker legend whose team mysteriously disappeared right before the tourney finals in the 1960s. When Dax sees he can still ball, they go on a journey to collect the rest of the squad (portrayed by Shaquille O’Neal, Chris Webber, Reggie Miller, Nate Robinson and Lisa Leslie), and bring them back to the NYC playground for the big game.